English wine continues to go from strength to strength, and a trip to a vineyard is a wonderful way of finding out more about the way the industry works – and discovering some delicious new wines, too. Most are open from late March or early April until October, so now’s the time to start planning your visit. 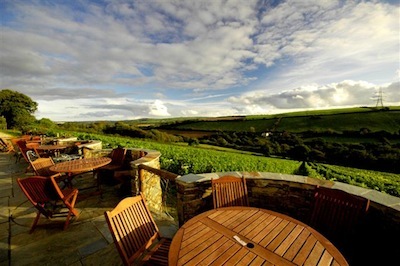 On a sunny day, multi-award-winning Camel Valley (above), near Bodmin, feels almost Continental. Visitors can take part in a tour led by the enthusiastic and knowledgeable (but never snooty) staff, or order wine by the glass or half glass to sip on the terrace while they admire the view of the vines below. The Grand Tour and Tasting (£12.50 per person, booking essential) runs every Wednesday evening at 5pm, between April 1 and October 30, with additional Thursday tours during August. Chapel Down, which has been producing wine on its Tenterden site for 22 years, is fast making a name for itself as one of the top-flight English wineries. You’ll find out some of the secrets of its success on a guided tour and tasting, which run three times daily from April to October. They book up quickly, so it’s best to telephone before you set off. On a fine day people who’ve joined Chapel Down’s Vine Leasing Scheme, where you sponsor a vine, can picnic in ‘their’ vineyard too. in the cinema, indoor winery tours and cellar tastings. A real place of pilgrimage for wine lovers, 75-acre Three Choirs combines a working winery with a restaurant serving delicious locally sourced food, accommodation on the edge of the vineyard and an excellent shop. Guided tours and tastings (£12.50 per person) run all year round, as well as a vineyard walk that incorporates a nature trail. of wines before peeking into the winery and meeting winemaker Stuart. wine-and-cheese events, which take place throughout the year.